$5.34 Winco KFP-35 One Piece Paring Knife 3-1/2"
Complete a variety of kitchen prepping tasks with this premier paring knife. Crafted with a forged, stainless steel blade, it is hardy, durable and strong. With a 3.5", razor sharp blade, it will slice, carve and peel both fruits and vegetables with ease. Also equipped with a plastic handle, it offers a comfortable grip for commercial use in busy restaurants or catering businesses. This has become my favorite paring knife. Whether I'm peeling rutabaga, or digging out the black spots from some fresh farm carrots, this knife is a pleasure to use. The curved drop point blade works well for digging out those little unwanted spots on produce. It's light as a feather, and fits comfortably in my hand. As with other FDick knives I own, the quality of their steel continues to impress me. It's hard enough that the edge stays straight, rarely getting dings or folding on itself. Yet it can still be worked with a honing steel, without chipping. After an initial sharpening on a whetstone, I have been able to keep this knife sharp with a honing steel alone. Blade width (top-to-edge, at handle): 3/4"
+thin yet rigid blade. it flexes very little. 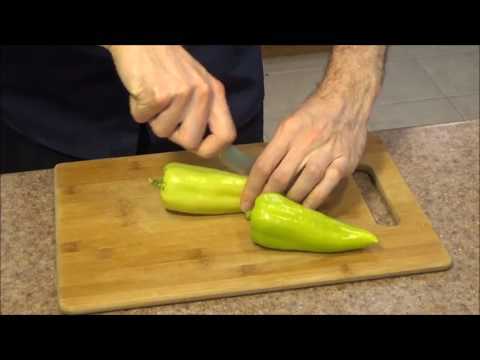 +drop point blade tip is great for digging out unwanted spots in produce. +bolster provides protection when peeling (by positioning your thumb joint over it). +-handle felt a little small to me at first, though I like it after I got used to it. +angle on the edge bevel is perfect, at 15 degrees. +handle integration is very good. The transition from plastic to metal is smooth. +no sharp edges. I didn't have to do any polishing to get this knife ready to use. -Out of box, the edge was a little dull. This was easy to fix with a #8000 stone. 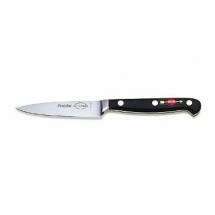 +lower cost than comparable German-made paring knives. 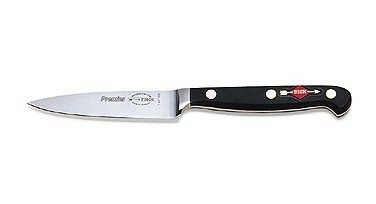 For example, the Wusthof classic paring knife comes in at $50.